Southern California is home to various plants commonly known as sumacs. They are all part of the cashew family, and they can all be toxic to one degree or another. Even the cashew fruit that we eat is toxic if it isn’t soaked and processed prior to eating. Sumacs are interesting medicinal plants, used by the Indians of this region for many different ailments. Some sumacs can cause dermatitis, but not everyone is sensitive. Our coastal sage scrub is home to lemonade berry, Rhus integrifolia and sugar bush, Rhus ovata. Both were used medicinally. Both have glossy green leaves, oval shaped with a pointed tip and an obvious midrib. They have white to pink flowers in the spring and pinkish berries in the summer. The berries were steeped in water to make a sour lemonade-like beverage said to quench thirst. Berries of the lemonade berry are larger than those of the sugar bush. Here on Mt. Laguna our most common sumac is the skunkbrush or basket bush, Rhus trilobata. Some of you may have know this plant as squaw bush, a name that is nono longer used. Skunkbrush can be mistaken for poison oak, Toxicodendron diversilobum, also a member of the cashew family. Both have shiny leaves with scalloped edges, in groups of three. Skunkbrush has red berries and poison oak has white berries. This is a sure way to tell the difference. Both have leaves that turn red in the fall and are deciduous. Skunkbrush is a distinct bush while poison oak can be vine-like or bushy. They grow in similar areas, below 6000 feet. I’ve found skunkbrush on the Pacific Crest Trail, south of the Desert View and going down Pine Creek Road at about 5000 feet. There’s probably poison oak along Pine Creek also, but I haven’t encountered it. It tends to like streamside habitat. Skunkbrush grows in drier areas, but poison oak can also be found in dry wooded areas or chaparral. Take the time to learn the difference! Skunkbrush, also known as basket bush, was a primary source of basketry material for the local Indians. Medicinally, skunkbrush was used for coughs, colds, stomachaches and bowel problems. Celia Garcia reports that the Chumash used skunkbrush by making a tea of the leaves. They also ate the berries and dried them to make into soup. Like most plants, the local Indians had many uses for skunkbrush and other sumacs. 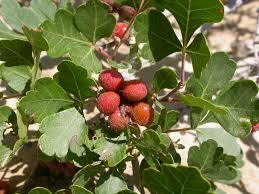 They even used poison oak in tiny amounts to provide immunity against poison oak rash. Please don’t try this yourself—it can backfire terribly! But do look for skunkbrush when you’re out hiking and appreciate the many gifts it provides.